We had less than 10 hours in the Almeria port and Maike was able to show us a wonderful trip to Granada and the Alhambra. She and her driver met us right outside our ship and we were on our way to Granada without wasting any time. Along the drive, Maike shared many facts about the area and gave us a clear picture of what to expect throughout the day. The ride was very comfortable for our family of 5. We arrived in Granada and first stopped in the old town so that we could get a good view of the Alhambra. We walked through some quiet streets while hearing about the history. We had some time to take some pictures of the Alhambra while having a coffee break at a local shop. Afterward, we drove to the Alhambra where we stopped for some sandwiches and then entered the gardens. After leisurely walking through the gardens, Maike guided us through the palaces offering an extensive explanation of the history. We had many opportunities for pictures and questions. We toured the three palaces and then met our driver for the return drive. On the return we took a different route which allowed us a great view of the miles and miles of greenhouses. Overall, the tour was very informative, well-planned and enjoyable. We will always remember our trip to Granada. We would highly recommend Maike if you are considering a tour in the area. After exchanging stories from our day with other cruise-goers, we realized how much more time we had visiting Granada and the Alhambra than any other tour because of the flexibility and reliability of Maike's tour. It was a wonderful experience! Join in and write your own page! It's easy to do. How? 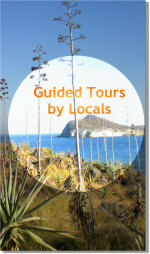 Simply click here to return to Andalusia Guided Tours.